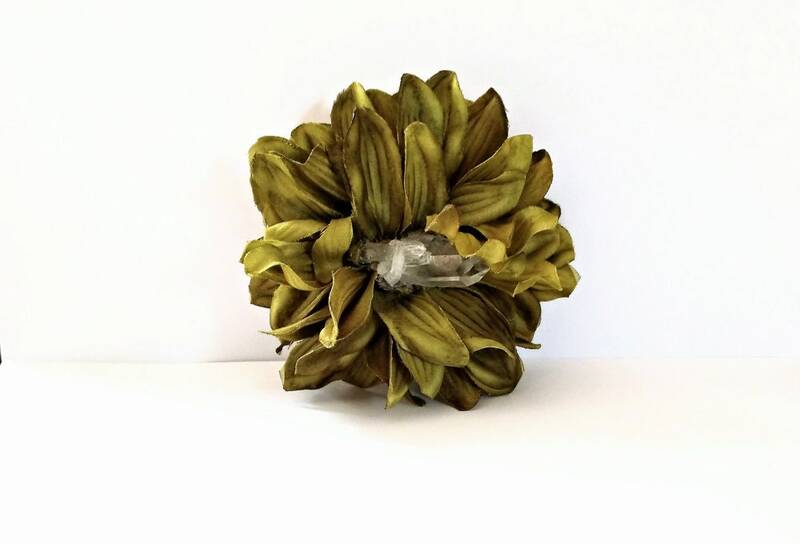 Embrace your natural beauty with this Olive Green Quartz Hair Flower. This hair clip is approximately 4 inches in diameter and attached to a durable metal alligator clip for comfort and security in every hair type. In this piece, is a large chunk of QUARTZ CRYSTAL, which is believed to be excellent for complete mind/body healing. It is also used as a meditation tool, as it amplifies energy. This piece is perfect for formal and casual occasions. Love my flower/crystal hair pin. Can't wait to wear it. What can I say? Of Course I LOVE the CINDY BLOSSOM BOBBIES, and my daughter loves them too. This is my fifth purchase and I believe it's time to treat myself to a crystal hair flower. I love adorning my crown with your creations, they always remind me to love and take care of myself. Due to the nature of our product, payment for items from Flowers From Fatima is nonrefundable. Please handle gently. Due to fine silk material, please avoid heavy oils in places where accessories will be worn, as this may tarnish the petals or weaken glue fixation. All items are sent First Class. Purchase will be received within 3-5 days. Note: In an attempt to be more Eco-friendly, I will be using recycled materials to ship your product. All of my delicate work will still be carefully and beautifully wrapped for protection. Life is cyclical. Help me to continue caring for the Earth. PLEASE RECYCLE the shipping materials. By purchasing and accepting products and services from Flowers From Fatima and associates, you agree and accept the following terms and conditions. Flowers From Fatima and associates are not licensed psychologists, doctors, chiropractors, or other healthcare professionals. All information provided by Flowers From Fatima and associates is for informational purposes only. No information provided should be considered a guarantee of cure, happiness, gain, or success of any kind. The United States Food and Drug Administration has not evaluated any statement, claim, service, or representation expressed or shared by Flowers From Fatima and associates. By accepting services from Flowers From Fatima and associates, you acknowledge that all information and products promoted are not meant to diagnose, treat, prevent or cure any disease or condition. All information provided is based on research, personal experience, and opinions of Flowers From Fatima and affiliates and should be used at your own discretion. By accepting services or submitting payment for services or coaching from Flowers From Fatima and associates, you acknowledge that Flowers From Fatima and associates are also not responsible for any direct or indirect consequences, losses, or damages by the use of the information provided to you in programs or services. Flowers From Fatima will not be held liable for anything that happens as a result of taking the program. Please consult a doctor before making any health changes, especially any changes related to a specific diagnosis or condition. No information on this site should be solely relied upon to determine diet, make a medical diagnosis, or determine treatment for a medical condition. The information in this program is not intended to replace a one-on-one relationship with a qualified health care professional and is not intended as medical advice. For all orders of at least $100, a deposit of half of the total retail value must be made and will be specified upon consultation. We accept deposits through Paypal and Google Checkout. Upon receipt of deposit, order will be started. The remaining balance is required upon completion of the order. The deposit secures the completion of the order and agreement by the customer. Deposits will not be refunded, unless finished product is damaged. In order to keep our customers up-to-date with our latest products, services, and exclusive promotions, Flowers From Fatima collects customer information to communicate with you through our online newsletter, which is issued monthly. Customers are automatically added to the Flowers From Fatima mailing list and will receive the official Flowers From Fatima newsletter to the email address provided upon purchase. All information is secured and will not be shared with any third parties. Customers may opt-out of the subscription at any time by emailing FlowersFromFatima@gmail.com or following the "Unsubscribe" link provided in each newsletter. Customer's email address may be used in case of corresponding to custom orders, tracking orders, processing orders, and helping customers to track their orders, online. Flowers From Fatima does participate in wholesale requests. Email FlowersFromFatima@gmail.com for a wholesale price list and Conditions & Terms of Sale policy.